What Is The Most Effective Baseball Regimen For Increasing Speed? What is the most effective baseball regimen for increasing speed? This week we have two forum members who have put together some great information on this very topic. Learn more right here. TOPIC: What Is The Most Effective Baseball Regimen For Increasing Speed? It's obvious that the baseball players of today seem to spend more time in the gym than on the field. Some may spend more time building power, but there are also those who spend more time building overall speed and strength. What is the most effective workout routine a baseball player can do to increase overall strength? What type of program and/or drills should one perform to increase bat speed? Bonus Question: What do baseball players do in bad weather to keep muscles warm while they are waiting to bat? What MLB player has the weirdest warm-up tactics? In Harold L. Klawans' book, Why Michael Couldn't Hit, the author explains that due to the neurology of the sport of baseball, it is impossible to begin to play the game from scratch once our brains have matured. But that is due to the hand-eye baseball specific coordination involved in the sport. There is no reason that one cannot drastically improve their chance for success in the sport through gaining strength and overall athletic ability. 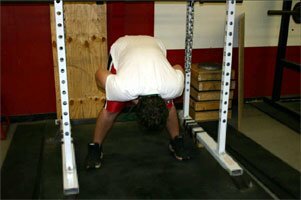 Increasing overall strength is not sport specific. Strength is strength whether you stand on a gridiron or a diamond. Pure strength leaves pure potential to further one's playing ability in most sports. And baseball is a great example. Baseball requires many different skills that make it an all around sport. Each one requires many hours of hard work on the field and in the batting cage. But they can all be improved through time in the weight room as well. In this article, I will focus on the running and batting aspects of the sport. The aspects that made a guy like Reggie Sanders famous. Before we can get into specifics, a player should have a relative abundance of pure overall strength. A basic program such as this one which is designed for a football player, but when it comes down to it all, it's simply strength we are training. Remember, just because we are training to become stronger, doesn't mean we have to change the way we play the game. Becoming stronger and gaining muscle mass is no excuse to lose flexibility or lose the groove of your swing. Barry Bonds' ability to become strong and powerful without losing his sweet swing is the reason he looks to pass the Babe [George Herman Ruth] this summer (What he allegedly did to gain this strength is not important to this article). As you increase your overall strength, your bat speed will increase accordingly whether or not you pay extra attention to the specifics involved. But I'll get in to those specifics anyway. When you swing a bat, you twist your body with the power to let your arms follow through to make contact with the ball. The stronger your abs are, the faster and more powerfully you will be able to move the bat through the zone. This means when you make contact, the ball will travel farther. More importantly, if you can get the bat through the zone quicker, you will be able to wait longer to read a pitch and crush it when it comes through. More core strength means less guessing. If a football player wanted to explode through a tackle, he wouldn't do body weight squats, so why have you been doing crunches your whole life. To increase core power in your abs, add resistance like you do with every other body part. The Full Contact Twist, advocated in this article, is probably the most baseball specific resistance exercise a hitter can perform. Your abdomen recovers more quickly than the rest of the muscles in your body. They, along with the grip and calves recover in about half the time as other muscles. So you are in luck. Hit the abs early and often. Your hands must always be in full control of the bat through the entire swing. This will help you get the head of the bat around. You can train your grip through a variety of methods, and all should be utilized. Crushing Grip: This involves closing your hand around an object that will give way. You can squeeze a tennis ball or you can move up to the big boys and purchase grippers. Static grip: This means maintaining a grip on an object for a period of time. The plate pinch. Whatever methods you choose to increase your grip strength, just remember that grip is also among those big three (abs, grip, calves) that you can hit with frequency. Your legs will anchor you through the swing. Any program you follow should already be rich in the basic movements required to build strength (Mainly squats) and if it isn't, you should seriously think to revise your routine. What are the most effective ways to increase speed on the ground? The potential for speed comes from strength. Relative strength to one's body weight usually produces the power needed for a base runner to hurl along the base paths and score from first on that gapper or an outfielder to chase down that very same fly ball. Put quite simply, speed kills. Straightaway speed on the base paths or in the outfield. Lateral quickness from an infielder to get that ground ball. 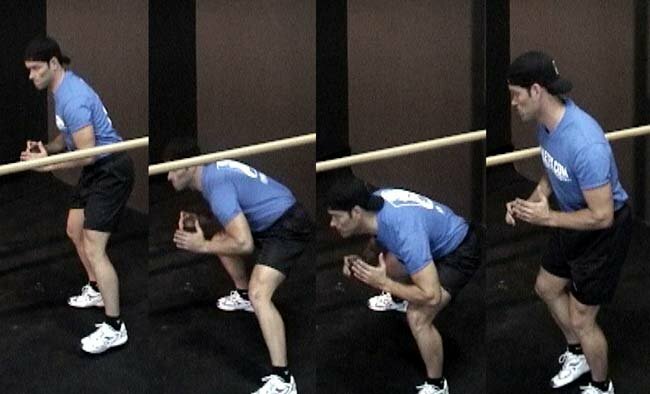 Strengthen your Posterior and you will be sure to see an instant gain in speed. Don't have the equipment required for some of these lifts? No Problem! Lateral quickness comes from overall flexibility as well as hip and quad strength. A player must reactively spring to either side as soon as the ball leaves the bat. Again, strength brings with it the potential to make this move in as little time as possible and thus gives you a better chance to run down more balls and make more plays. A player's ability to go 0-100 as quickly as possible is the one thing that makes a player a great base stealer. A player must take off from a completely neutral position and immediately be headed full tilt toward the bag. The difference between safe and out is almost always only a fraction of a second. A great exercise to improve hip flexibility and to get used to pushing off one leg in a lateral movement are duck unders. They can also be involved in any warm-up to a squatting session to help gain results and avoid injury. To perform a duck under, simply setup a bar that is an appropriate height and step under the bar laterally. Flying 30's are a great way to improve top-end speed. Begin at a jog and on a signal, break immediately into a sprint for 30 yards and then come back to a jog. Repeat three times. 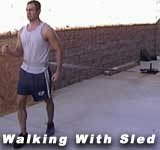 Sled pulling and uphill running are great ways to improve acceleration. One strategy to improving speed is to join track! You will receive good coaching and be pushed to be your fastest. I always recommend this to people. You will have a lot of fun becoming faster in this competitive environment. You will also be able to track your speed gains easily through meet performances. Track teams usually welcome anyone willing to bring a positive attitude, so don't be shy. What do baseball players do in bad weather to keep muscles warm while they are waiting to bat? What MLB player has the weirdest warm-up tactics? Baseball Players stay warm by wearing a jacket when they are in the dugout. In the warm-up circle it is a standard process of loosening up by stretching and some light hopping if needed. Along with the obvious practice swings. David Eckstein has the wildest and most renowned warm-up rituals prior to each at bat. He wildly swings the bat in all directions. It is one of the most entertaining things to watch at a baseball game. None of these swings look at all like a baseball swing either. It is up and down round and round swings of the bat in super-fast motion. It along with many other quirky characteristics make him one of the game's favorite players. In baseball, it's most important that one must realize their place on the team and then base their workout around their position in order to benefit the team. Naturally, a batter who hits leadoff isn't going to have the same hitting style as the clean-up man. First, let's start with your average hitter. Everyone has to face it at some point, we're not all destined to be the Barry Bonds of the team. Once a hitter accepts that he/she is going to help his/her team more by hitting 30 singles a year rather than two homeruns and 28 fly balls, they can then base their workout plan according to their role. and explode toward the ball with your legs." While this may be true for some players, it doesn't work well for all. My coach noticed that I was dropping my hands. which brought my swing up and I consistently hit pop ups that led to a sub-par batting average. He then told me to take my "loading" step before the pitcher even released the ball, which relies on nothing but your arms and hips to swing. The majority of my time was spent doing incline, decline, flat bench and flyes, and with many curls and pull-downs. For shoulders and back I did chin-ups, shrugs, and military bench. With a stronger upper body came quicker swings, which led to more hits over the infield, that led to a much higher batting average of .438 (9 for 21 at the moment) than the previous .261. Second, I will focus on the power hitters. These are the hitters who are expected to hit the ball long and hard. These are the ones who have to use every bit of muscle they have when they get the pitch their looking for. Often these players are some of the heaviest lifters on the team, and their training splits are normally well-rounded upon all body parts. Because the hitters have to explode with their legs, cast their arms with their shoulders and chest, and forearms to "snap" the bat head through the strike zone, it takes a balanced lifting schedule to pay appropriate attention to all needs. Neglect any zone in weight training and it will mean the difference between a crushing home run and a routine ball to the left fielder. Our cleanup hitter has his own routine suggested to him by our coach, in which he does all lifts to keep a well-rounded hitting form, which recently led to him being our town's Tryon Federal Bank player of the week for hitting three home runs in back-to-back games. Last, I will focus on pitchers. Pitchers have to be extremely careful with weight training, because any change in their motion is extremely detrimental to their form. The majority of coaches (high school, collegiate and professional) will not allow their pitchers to do anything except cardio during the season simply because the chance of one of their highest priority players getting hurt is just something they cannot risk. During the off season, pitchers are expected to do much of the same routine as the power hitters. 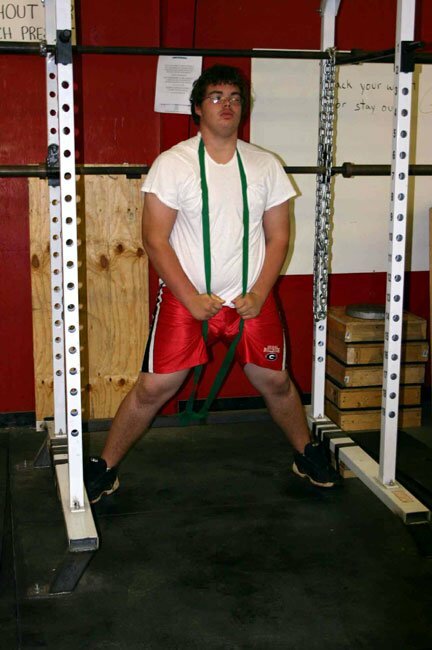 Being a well-rounded lifter helps the pitcher use his/her legs to push off the pitching mound, or use the shoulders and triceps in order to create arm speed. To be a powerful pitcher, a balanced weightlifting split is essential. There are so many factors that go into bat speed. There are numerous studies that suggest what the most effective drill to help bat speed should be. Ironically, the majority of them just contradict each other. In my own experience, I found that the most effective drills to improve bat speed are often some of the least performed. "Soft toss," in which another person tosses a ball from your side underhanded, and you are forced to clear your hips out of the way to turn on the ball is extremely effective. You force yourself to use your hips, which in turn makes the rest of your body (including your arms) turn at a faster pace to create more speed. Another effective drill that is becoming more and more popular is simply hitting off a tee. Although this seems elementary to some, nothing builds up perfect form and speed like good and proper repetition. If I had to pick one muscle group to train in order to create bat speed, it would have to be forearms. I got my forearm routine for Bodybuilding.com. Click Here For A Printable Log Of Intermediate Routine #1. Click Here For A Printable Log Of Intermediate Routine #2. *I DO NOT take credit for these routines, they are directly from Bodybuilding.com. When you properly train your forearms, you allow yourself to "whip" the bat around through the strike zone quicker. It's simple, the quicker you hit the baseball, the farther it goes. Speed, speed, speed. It is a huge factor in baseball. Many plays in baseball are made in tenths of a second, so to be as quick as one possibly can is extremely important. Speed alone can take a .250 hitter and turn them into a .300 hitter in nothing but infield singles. As a first baseman, my coach told me if I wanted any chance of playing some local college baseball, I needed to increase my speed. At the time I ran a 4.9-second 40-yard dash, which wasn't even near low enough. So naturally, I tried to take the easy route and went to look some baseball catalogues for training chutes and strength shoes. After much deliberation and research, I figured this would be a lot like bodybuilding in which there is no substitute for hard work and dedication. After asking around, and doing some research, I still had trouble finding out which would help my situation the most, long distance or sprinting, so I decided by doing 40's and 200's in addition to stadiums, that I would get the best of both worlds. Soon after, I started a pyramid routine that I implemented before the season started. I started by doing six 40's, 10 stadiums, and two 200's in the quickest time I possibly could for each exercise. In addition to doing this three times a week, I would up each set by two reps every week for four weeks, until I felt like I had hit a plateau in which I maintained the same numbers up until baseball season. I made it a goal to make sure I didn't time myself until the season started, for fear that if I saw any gains I would lighten up. By the start of the season, I was running a 4.7, which may not seem like much to others, but I had accomplished my goal. Although no college offers have surfaced yet, I'm still proud of myself for pushing through and making myself better. Cold weather is something all athletes are eventually going to face. It is common knowledge that cold weather can lead to much easier muscle pulls and slower reaction time. The most visible players you can see keeping warm are the pitchers. If you see a pitcher (sometimes even in the summer) in between innings, he always has a coat on his pitching arm. This is because when a pitcher throws, his arm muscles stretch. If his arm starts to cool down, which tends to happen if his team has a big inning at the plate, then the next time he throws the muscles aren't "warm" and makes it harder for the pitcher to control the ball and has the potential to injure himself. For the non-pitchers, what I do in between innings is put on a hoodie, and wear batting gloves that I keep in my back pockets. These gloves are already warm due to body heat, and any baseball player will tell you, keeping your hands warm is the main key to playing well in cold weather. Doing this in addition to stretching VERY well before the game is my normal solution to the winter weather. The weirdest warm-up tactic hands down had to be Ozzie Smith. (MLB Hall of Famer for the St. Louis Cardinals) Every time Ozzie would run to his position, he would jump and do a back flip, supposedly to stretch his legs. Ozzie says it was a stretch, but many believe it was just a gimmick, although it did become his trademark. He took a lot of criticism at the time. A lot of people enjoyed it, and a lot of people hated it saying it was too flashy. Either way, Ozzie did it all the way up until the end of his career in 1996. There are many theories on baseball, and these are just mine. What do you feel are adequate supplements to take during baseball season to peak performance? During the baseball season is not the time to try anything extreme. Most won't even suggest creatine in season, simply because a lot of baseball games are played in pretty warm weather and creatine can severely dehydrate one if not properly taken care of. I feel that only a few supplements are really needed during season. One, is a good multivitamin. NOW's ADAM multivitamin has a great write up, and for under ten dollars it's hard to beat. Second, I would suggest protein to take before and after workouts. Optimum Nutrition has excellent pricing on the 100% whey protein-gold standard and great reviews about taste and mixability. The last supplement I would suggest would be glutamine. Because baseball often has up to 3-4 games in one week, lifting a day before the game often leads to a bit of soreness upon game day. To combat this, one can use glutamine so they aren't limited by the soreness the day after lifting.I would buy in bulk; in order to last one all season. Higher power sells 1000 grams which would easily last through all of baseball season for $29.99. In my opinion, I think that these supplements would make for the best in season baseball stack.